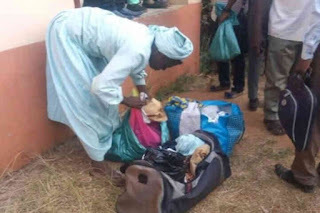 Stealing of ladies undergarments of any sort including their used sanitary towels all for ritual purposes have become a major problem and the Nigerian Police has announced that they will no longer investigate matters concerning stolen pants. Popular Ifa priest and Awise of Lagos, Fashola Savage, has revealed that a terrible ending awaits internet fraudsters, popularly known as Yahoo boys, who use female pants for money rituals. In an interview with the New Telegraph, the Ifa priest was reacting to the recent trend of men snatching female underwears allegedly for ritual purposes. Quick money: Also speaking on the trend, the founder of the Faith Revival Apostolic Church (FRAC), Paul Adenuga, said the main reason behind the stealing of pants by young men is the quick money syndrome. Speaking at the Christina Press of Nigeria (CPAN) breakfast meeting, The popular cleric stated that the stealing of female pants for ritual is a very disgraceful act. Pants now ‘hot cakes’: According to reports, some ritualists, also known as ‘Yahoo boys’, have been stealing female underwear, sometimes at gunpoint, particularly around campuses of tertiary institutions in Delta State. Although the veracity of the claims that such stolen undies are used for ritual purposes has not been established, such reports have instilled fear into the hearts of ladies living in such areas, resulting in fear and panic. And in the ensuing panic, it was learned that many ladies in the affected areas in Delta have been devising ways to safeguard themselves against danger. It was learned that the underwear of girls and women, particularly of ages between 14 and 35, are allegedly considered as ‘hot cakes’ for use by the ritualists. Used pants, according to some students at Asaba campus of the Delta State University, sells for as much as N350,000, with some adding that the price can be higher if it is confirmed to have body fluids. Pantless females: At the campus, it was learned that one of the measures being used by female students to protect themselves is to go out without wearing pants. For instance, a student of the school, who lives outside the school campus and who only identified herself as Esther, said three of her friends had started employing the strategy of going out without wearing pants. Ladies be very careful of who you associate with, your lifestyle and places you visit. We hope the end to this menace comes very fast.